The role of the Facilities Manager is to ensure that the physical environment is always consistent with the needs of the business. That means ensuring that the amount, location and con guration of working spaces is optimised for current and future functions, staff numbers and business processes. The Facilities Manager must also ensure absolute compliance with numerous regulations and laws, including the Health & Safety at Work Act (HSWA), environmental legislation and various industry-speci c rules. Keeping facilities safe – i.e. ensuring the safety of staff and visitors to the premises – is a key role of a Facilities Manager. 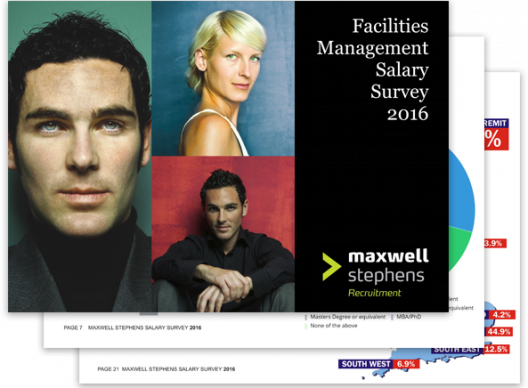 Maxwell Stephens 2016 Facilities Management Salary Survey. A Facilities Manager is a hidden hero in a company. A great facilities manager is just like the power company; you don’t think about them until they aren’t working correctly. 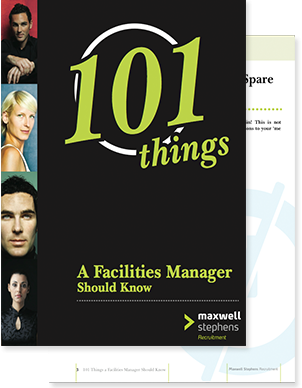 Download our ebook to find out about what makes a a great facilities manager. The job search is increasingly simple. Online search engines and social media platforms make the process easier for us. The CV stage is somewhat harder, however. 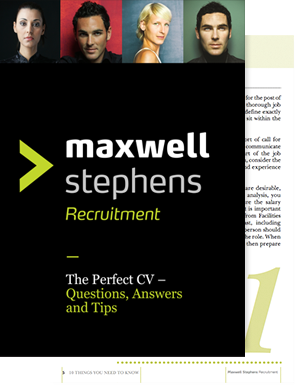 Download our e-book for advice on writing the perfect CV; your questions answered! Simply having skills is no guarantee of success. Just as a great product is rarely a success if poorly marketed, simply having skills, knowledge, experience and even track record is no guarantee of success skills as an interim manager. Many aspiring interim managers underestimate the amount of marketing they need to do in order to succeed. 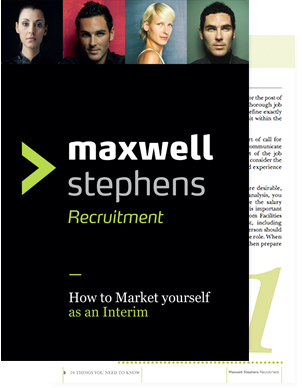 Download our ebook for advice on how to be the best interim manager. Many of us have found themselves in the situation; you have secured yourself an interview for your dream job, but the dreaded nerves have set in. Interviews can be terrifying experiences, especially when you really want the job! However, when you get past those jitters and prepare yourself, a great interview is within your grasp. Download our ebook for expert advice on interview techniques. Looking for a job isn’t always the easiest of things to do. Whether it is your very first step on the career ladder, a move to a new career or perhaps a return to work after raising children it can seem pretty daunting. 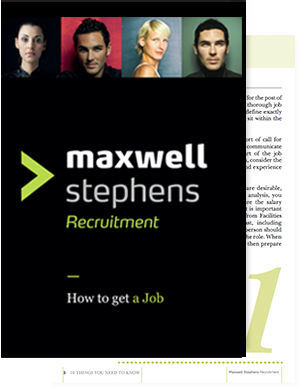 Download our helpful guide on how to get a job. The process of looking for a new in job In FM can be frustrating, disappointing and sometimes it feels like you’ll never achieve the results you want. 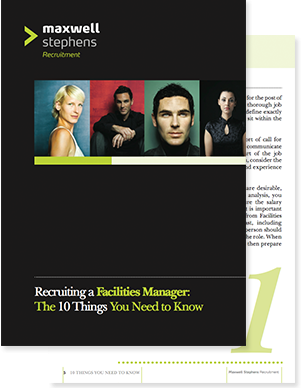 Facilities Management (FM) is a complex sector and currently has a highly competitive job market. You need to prepare to succeed and ensure you stand out from the crowd. If you are looking for that next dream job, these 30 do’s and don’ts will help you position yourself well and give you the best possible chance of success. 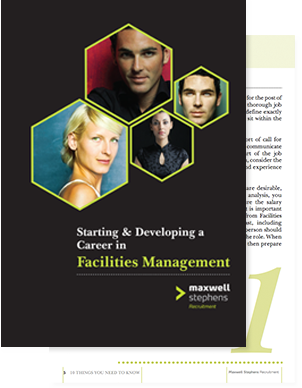 Maxwell Stephens 2014 Facilities Management Salary Survey. 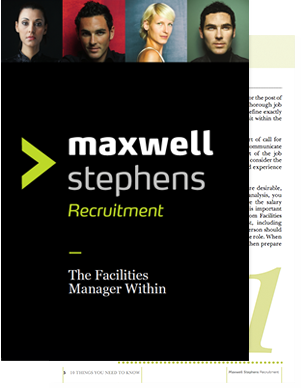 Maxwell Stephens are a renowned UK professional services agency that specialises in facilities management recruitment. 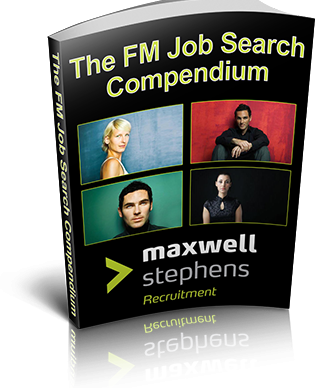 Maxwell Stephens specialise in filling FM Jobs and we have produced this guide to assist Facilities Professionals land their next FM role in the FM World. You gave us suggestions – and we listened! 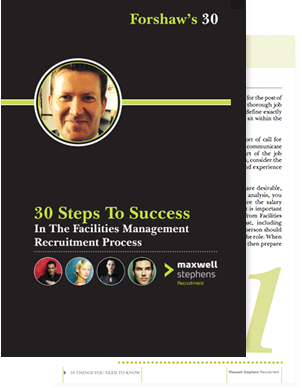 As facilities management recruitment experts; Maxwell Stephens endeavours to share our knowledge and provide you with realistic and relevant information on the industry.